Since Dean has been badgering me to set up a View-Line thread, here it is!! The Atkinson View-Line was first launched at the 1966 Commercial Motor Show at Earls Court - pre-dating the Renault Magnum by a quarter of a century! When I can regain access to my archives, I'll scan the article in the Atkinson house magazine from that time, but some of the thinking behind the design is explained as offering "freedom of front axle location for overseas territories", ease of access for engine maintenance (referring to tilt cabs as something like, "one of those troublesome fads which plague the industry from time-to-time" ), interior space and, of course, visibility. Not to mention the steering column, pedals and driver's seat all being aligned!! 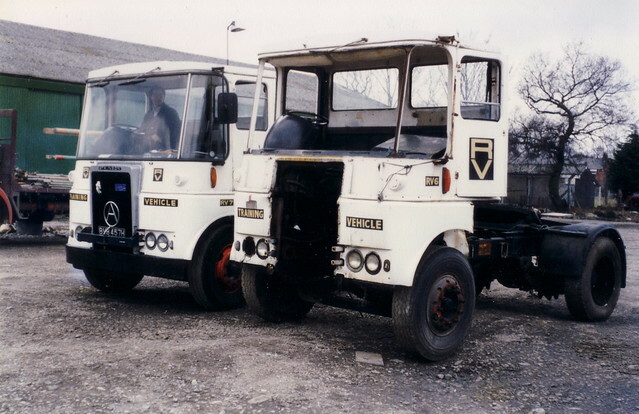 Although many people associate the View-Line with the RTITB, Pickford's Heavy Haulage division was the largest buyer by far, largely 6x4 tractors plated for 45T gross, but there was also a batch of 4x2 ballast tractors, rated for 42T as an artic or 55T as a drawbar tractor, and a solitary 4x2 artic unit on the Westfields fleet. I owned one for 19 years, and still regret parting with it. It was very comfortable to drive and, despite apocryphal views, I had only one unbearably hot day in it. BVB 457H post-restoration, and coupled to a trailer which helps mask its ungainliness! 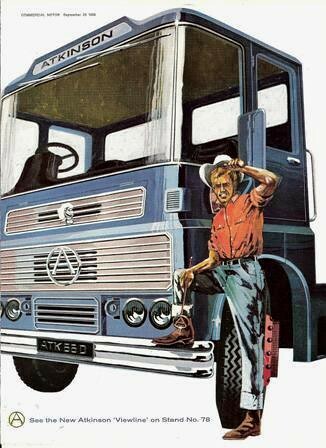 "A modern, forward-thinking, original design.... parked next to a Renault Magnum, at least 25 years its junior"
To be honest; for many years, I thought Atkinson made the Viewline specially for lorry-driver training schools. Thanks for the insight to this vehicle. Yes, it was quite well expressed! The clip does show some of the detail inaccuracies littering the book, though: the 44 ton tractor dates from the late 1960s, not the early 70s, the tractor at the bottom right isn't an Omega at all, never mind no.1, the little bonneted tractor is called a 'Semi Bonneted Tractor', not 'Special', and Pickford's took them all, but not all for heavy haulage. 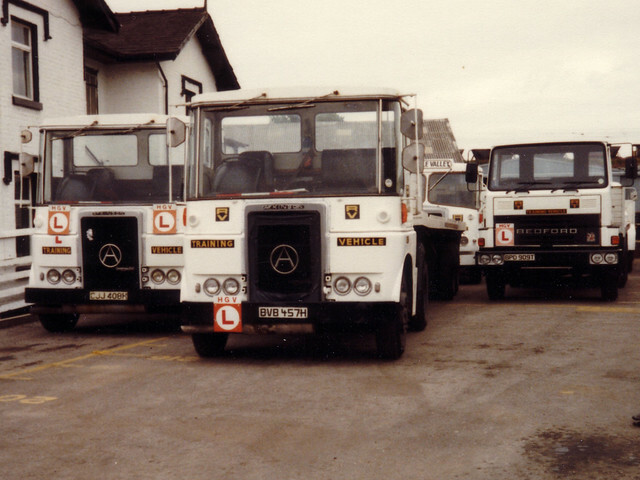 The 44T tractor in the photo went on to serve with Heanor Haulage, and has since been restored privately. Europeans,and see how many between us we can find ? Click on it twice to view. I remember the first one I ever saw. It was truly a stunning looking vehicle in its day. 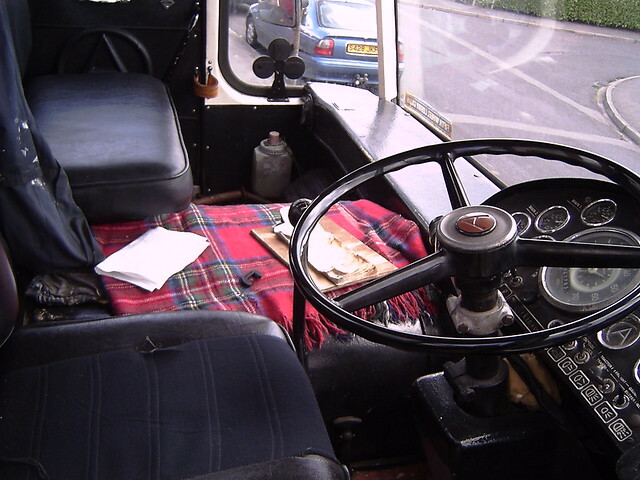 But the nearside mirror on the first photo in this thread was placed in an odd position. Or was I wrong all these years? Don't moan about getting old. There are lots of our friends who never got here. That sleeper can't have been made by Jennings- looks like you could almost get a full size bloke in that one! 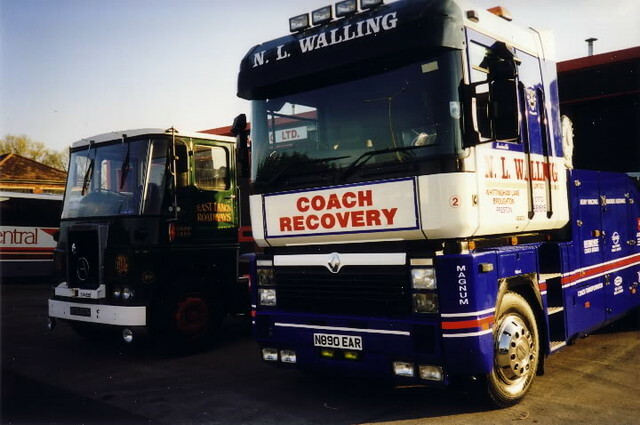 Lots of similarity in the Australian model to the View line except maybe not as much View due to our warmer climate I would say,but the tropical roof worked well and were a comfortable truck to operate and the sleeper models were roomy. I thought you'd never show up!! No, the factory didn't build sleepers at all. 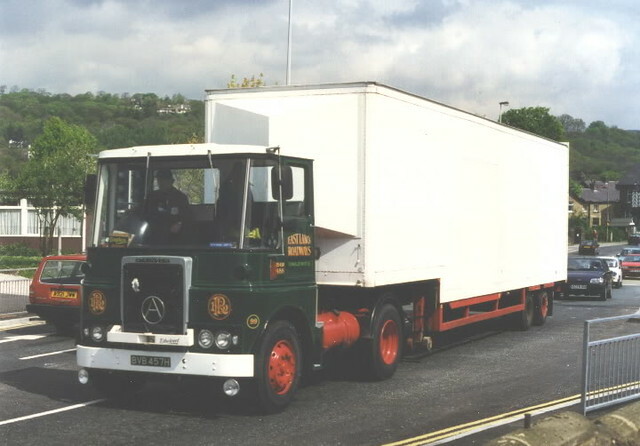 This conversion was done by Colin Barrett, complete with a wheelbase extension. David Miller wrote: I remember the first one I ever saw. It was truly a stunning looking vehicle in its day. I’m always up for a bit of comedy, you know that! Thanks Chris for confirming that. Were they only built as artic units ? Was this one factory built or stretched Chris ?? My agent in Jeddah sent his son over to the UK around 1976 with a big wodge of cash to buy Units, trailers, dustcarts & heavy haulage kit. 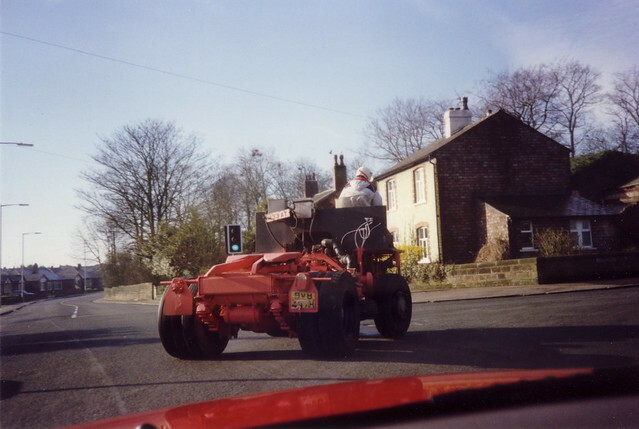 I don't remember the engine, I think it was a Cummins but could have been RR, but I do remember it had an Allinson pre-select gearbox. 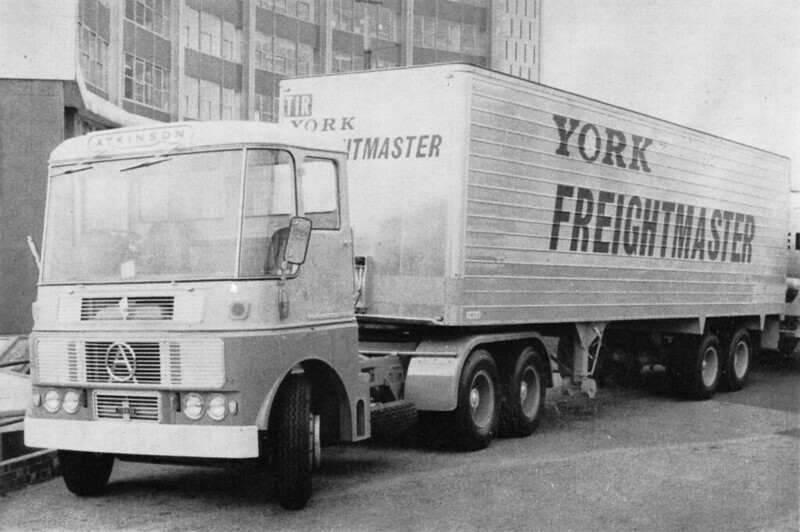 whisperingsmith wrote: My agent in Jeddah sent his son over to the UK around 1976 with a big wodge of cash to buy Units, trailers, dustcarts & heavy haulage kit.